The tool uses your sample documents and throughput requirements to calculate an estimate of how many request units will be needed to satisfy your application's needs. Because request charges vary with the size and shape (number of indexed properties) of your JSON documents, the tool supports multiple sample documents. 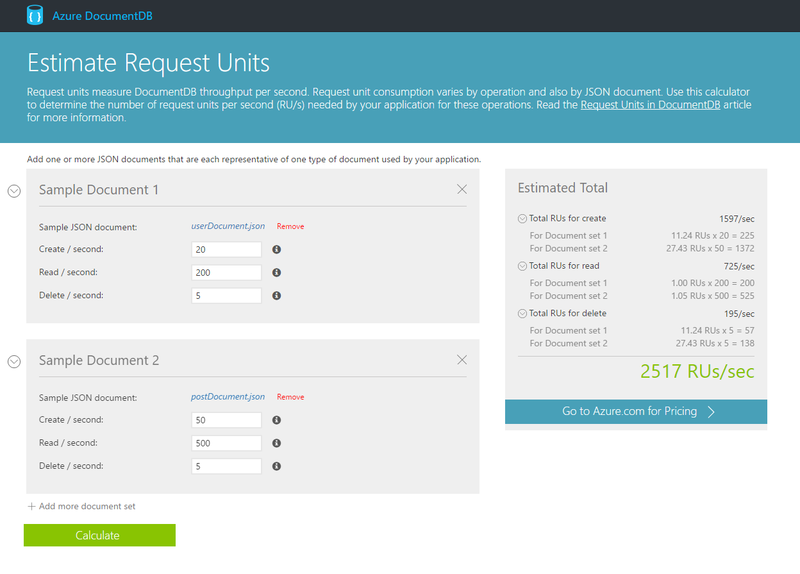 For full details on how to use the tool, see the Request Units in DocumentDB article. In addition, we'll keep improving this tool to help you accurately and effectively estimate your application's provisioned resource needs. To learn more about DocumentDB, visit the DocumentDB product page. If you need any help or have questions or feedback, please reach out to us on the developer forums on Stack Overflow. Stay up to date on the latest DocumentDB news and features by following us on Twitter @DocumentDB.